This year the Bollin Valley Partnership is celebrating its 40 year anniversary. The Partnership was initially set up in 1973as an experiment to resolve conflicting pressures on the countryside bordering South Manchester’s urban fringe and forty years later the Partnership is still going strong. 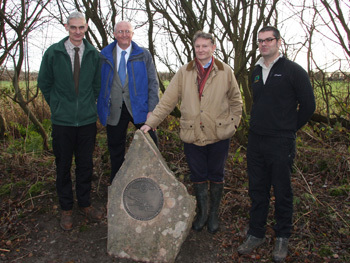 To mark the occasion we have installed a commemorative plaque at Macclesfield Riverside Park. We were joined for the opening by Cllr David Topping, Environment Portfolio holder for Cheshire East Councilwho commented “I am delighted to be able to celebrate this significant achievement. 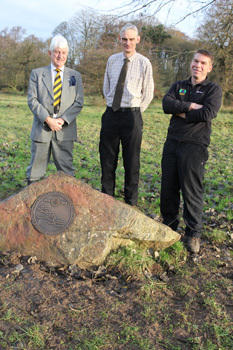 I congratulate the Bollin Valley Partnership on all the work they have achieved over the past40 years in the area.” Also present were Tim Harding Area Countryside Manager and Jim Middlemass, Countryside Ranger.